Straight line winds and heavy rains have taken their toll: the oats are bent over nearly to the ground and wedged into one another. I believe this is called lodging and you can see it in the photo. Around the edge of the fields, especially near the road, Minnesota’s newly identified invasive pest, wild parsnip has been giving me plenty to do just to keep it in check. You don’t want to mess with this stuff: if you get the juice on your skin and it gets exposed to sunlight you get a nasty burn. Ouch. But things are coming along: the oats should be ready to harvest in a week or so, there is progress on plans for a farm office and repairs to the old barn and I’ve cleared many of the trees from along the creek where I hope to put a crossing so we don’t have to go the long way round from the barn to the fields. The whole thing is overwhelming and exhilarating. I’m sure grateful for good friends who are helping in all kinds of ways. 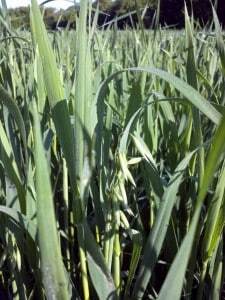 Strong winds and rains have ‘lodged’ the oats. The oats are up and doing beautifully, electricity is in and the well is working. Progress down on the farm! With help from neighbors, oats were planted in most of the tillable fields along with alfalfa and mixed grasses. This is a first step towards organic transition: no treated seeds, no GM anything, no prohibited chemicals. They’re doing nicely as you can see in the photo. All together, there are about 24 acres in oats just now. After the oats and straw are harvested – likely late July or early August – the alfalfa should take off. At least, that’s the hope! I never imagined I’d get so excited seeing oats grow! I’m thrilled. Go figger. Here’s an image of the oats, up close and personal so you can see the seeds developing. Maybe I’ll keep a bushel or two and see if I can make oatmeal, rolled oats or skirlie. But that’s for later. 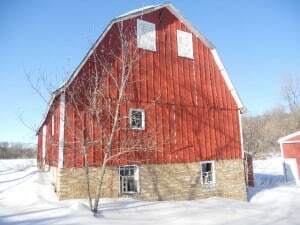 At the moment I’ve got more immediate jobs to do: gotta get the red barn solid, cleaned up and re-painted. Got to get a farm office sorted (with a working bathroom, I hope) and lots of thinking about the overall site plan. Where should I put a strawberry patch, raspberries, hops, asparagus or other perennials? What should I do about a crossing over the creek? And what about the gazillion boxelders and tons of buckthorn? So much to ponder. 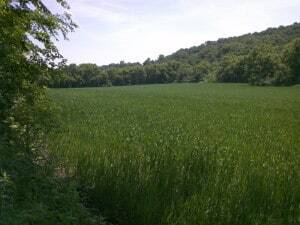 The picturesque Sogn Valley near Cannon Falls, Minnesota has seduced me. With no farming experience but a passion for sustainable agriculture we went and bought a 55 acre farm in this lovely area. The farm includes 25-30 acres of rich bottomland with a small creek running through it, the balance is south-facing woodland with old oaks, younger birches and, we’re told, lots of morel mushrooms. The fields have been rented for conventional corn and beans but this year I’m planting oats and alfalfa to begin organic transition. There are two barns but no dwelling at present, though there is one building right with the property. 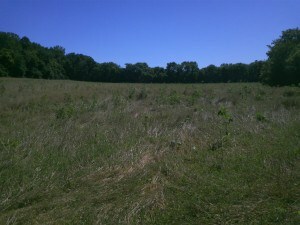 We bought this land because I think it has enormous potential: the soil is excellent, it is within an hour of a major market, it is near a transport corridor (Highway 52 runs from the Twin Cities to Rochester) and not far from a lively college town, Northfield, the hillside offers excellent solar resource in addition to its historic oak savannah ecology. But how do I realize this potential? I’m not a farmer, I’m a musician and scholar (ethnomusicolgy – go figger . . .). My dream is to find some folks who want to help creating a thriving, sustainable, resilient farm on this land integrating the fields, stream, woods and buildings. I don’t know what the best crop choices will be, but I suspect that a variety of products will yield the best results: some critters grazing, small fruits or berries, wood for heat, small grains, CSA or market vegetables, maybe hops for the burgeoning local brewing scene. I’m expecting some serious trial and error! We’ve only owned the land a few weeks so I’m overwhelmed with ideas and projects. But in the end I hope this will be home to a farm family of some sort that will thrive and, in time, take ownership of all or part of the enterprise. There are many, many steps between here and there but that’s my dream. I wonder if there is someone out there who’d like to play in this sandbox . . .
Offer accepted . . .
Just heard that our offer for this property has been accepted. 55 acres – 39 tillable – in the Sogn Valley, about an hour south of Minneapolis near Cannon Falls. At the weekly informal Transition gathering at the Blue Moon Coffee Cafe this morning, prompted by a new and thoughtful presence (welcome, Pierre! ), we considered the state of Transition in the Twin Cities. Here is one take . . .
Diffuse. There are pockets of Transition interest and activity in various neighborhoods around town and in various community groups. At present, none of these nodes has coalesced into a formal ‘Transition Initiative’. The Blue Moon gathering continues to provide a safe haven for folks concerned about Peak Oil and Climate Change, but awareness (or willingness to consider) these issues is largely absent from the general public as far as we can see. This observation prompted discussion of just what Transitioners hope to – and can reasonably – accomplish, given the real world in which we find ourselves. We acknowledged that getting the message out is not among our strengths (we’re clearly not getting that job done – as wonderful as our tiny group is, it’s still tiny). Thus the massive systemic changes that most of us believe are needed are far beyond our reach – at least for now. Given that, what might be more modest but achievable aims? The consensus this morning was: leading by example. Mostly around food but also energy and community, individuals are increasing their skills (reskilling?). In our collective view, the larger society will come to grips with the issues only when it is forced to do so. When that happens, we’d like to be ready to provide examples of resilience in our lives, homes and communities. And we want to have fun doing it. Sharing food, music, dancing and the arts is essential as we work together towards our attractive shared vision of a more connected, more human and lower energy world and as we cope with our ‘End of Suburbia’ moments and other challenges. What is the State of Transition in the Twin Cities? No one has the authority to say, but by example and by trial and error we all hope our individual efforts may serve not just ourselves and our families, but others as and when they decide to join the party. Welcome to youngwalser.net, Bob Young Walser’s internet outpost. Based in Minneapolis, Minnesota I hope to chronicle unfolding responses to the challenges of Energy Uncertainty (aka Peak Oil), Climate Change and Economic Change in the heartland of the U.S.A. With an eye to the ideas of Transition being developed in England by Rob Hopkins and others, I wonder what the evolution of life in the Midwest will look like and I hope to celebrate the successes of that process as well as to recognize the challenges. I agree with Chris Martenson when he says that the next 20 years will be nothing like the last 20 years. We shall see . . .